Dji’s Mavic Air is popular for its portability. The Mavic Air drone is extensively used for Ariel photography and to take some amazing quality videos. Avid travelers previously would find it difficult to carry their drones with them because it was another bag to carry, but with the air drone they found it very portable and easier to carry around. It has the distinction of being the first drone to have arms that fold against its body, making it very compact to carry even in pockets. Since, its launch, numerous brands came with the similar features and design, but the Dji air drone, has emerged as the most popular drone camera. Smaller and costing less than $200 than the Pro, the $799 Mavic Air also has folding arms, similar 4K camera and gimbal as the Pro. 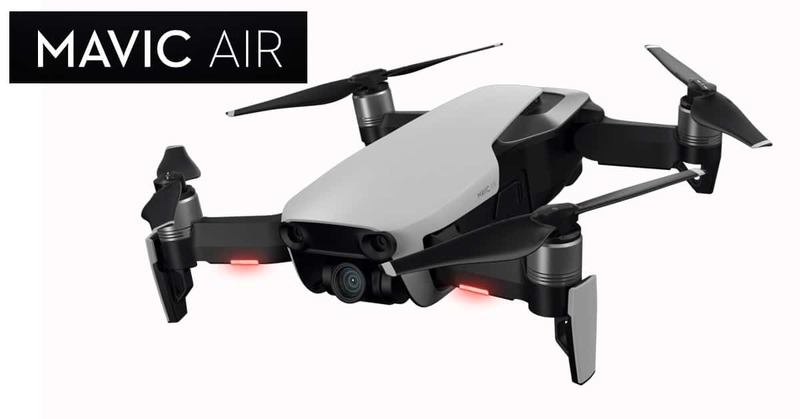 The Air is twice more expensive than the basic “Spark”, but cheaper than the larger Mavic Pro. The latest model comes with a new object avoidance mode that makes it easier to pilot even in narrow spaces making it the best drone camera. Dji has now established itself as a very popular and known brand in the drone market. It has extensive experience in making various types of drones to meet different needs and requirements. This may range from the basic domestic grade to the professional drones that come with larger and capable cameras. They have even developed a few enterprise grade drones that can lift large camera rigs. The Mavic Air is similar to the Mavic Pro, but smaller. The Mavic air looks cool with nice curvy features that give it a flying feel even when it is on the ground. Just like the Pro, the four arms of the Air rotate outward from the main body for flight mode. 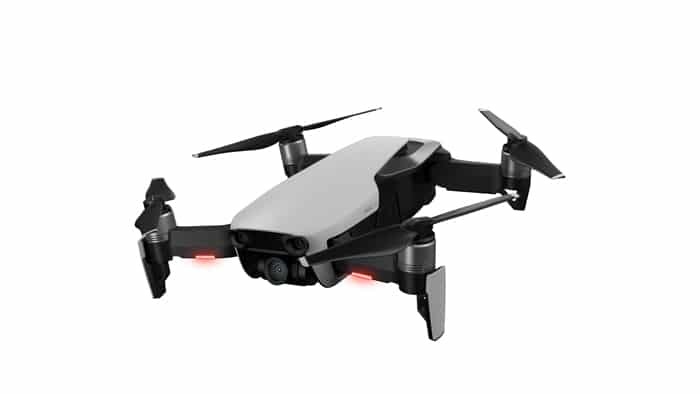 In the folded position, the Mavic Air is about 3.5 inches wide and 6.5 inches long. When the arms are extended, the size of the drone expands to about 7 inches wide, which does not include the rotors. 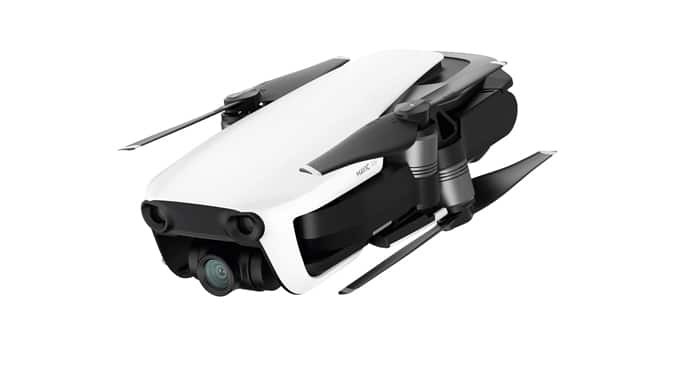 The front of the drone houses the 4k camera and a three-axis gimbal, which is similar to its larger brother Mavic Pro. However, the camera here is protected by the body of the drone from two sides. The camera was clearly exposed in the Pro and needed some protection especially while travelling. The Dji Air is studded with sensors that help in navigation. There are two forward looking sensors placed above the camera, while there are sensors on the underside and on the rear. The removable battery is placed at the bottom of the Air Drone with four lights that indicate the amount of charge it has. The Mavic Air might look similar to the Spark in size, but the similarity ends there. When folded, the Mavic Air can be easily carried in a pocket. It weighs 430gms, and is heavier than the 300g Spark, but is lighter than the 743g Mavic Pro. The Air drone comes with a zip-up case that just reinforces its size. It can easily slip into any of the pockets and still there will be plenty of room for other stuff. Even though the specifications are like a toy, don’t be fooled, this little guy is very well-built and quite robust. The recessed gimbal that comes with a clip-on cover makes it a perfect companion while on travel. However, putting the cover back-on can be difficult. Make sure the camera is facing straight ahead or else getting the cover aligned properly will be difficult. The Mavic Air comes in three different color options, white, red and black. The Mavic Air is the first DJI drone to introduce the USB-C for content transfer. The USB-C cannot be used to charge the drone. You will need the proprietary charger to charge the drone. The Dji Air comes with a MicroSD card slot with 8GB of storage capacity. Another remarkable feature of the Dji Mavic Air review is the redesigned remote controller. 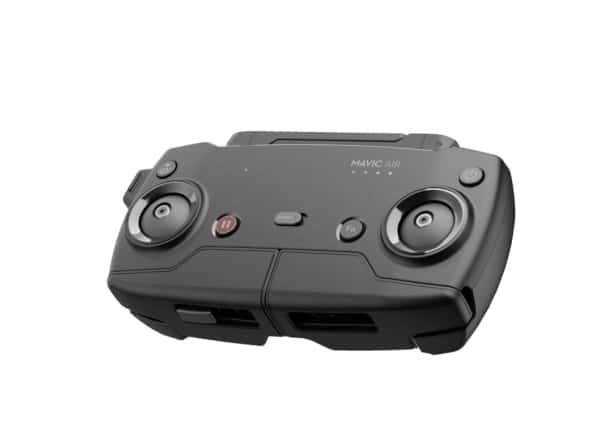 The joysticks for the controller are nicely placed under the foldable smartphone clips, giving the controller a flat surface allowing it to slide neatly into the pocket at the back of the drone’s case. It is easy to remove and store away. The controller for the Dji Mavic air lacks the built-in screen of the Mavic Pro’s remote for flight telemetry. But, you can easily use your smartphone to access live video feed and every other piloting information that you need. Setting up the Mavic Air is pretty easy if you have used a Dji drone before. If you haven’t then you will have to install the Dji Go 4 app on your phone and then follow the instructions on the screen to connect to the drone through Wi-Fi or by linking to the controller. Once everything is set up, then it is easy to fly the drone. Because of its small size, the Air drone travels fast. In the sport mode, this drone can reach a maximum speed of 68.4 km/h or 40mph. The Mavic Air is loud compared to other drones like the expensive Mavic Pro Platinum that comes with low-noise propellers. The Air drone will be heard first before it is seen. 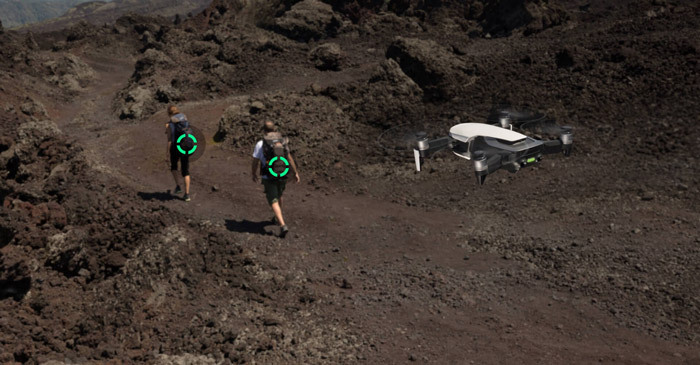 The Mavic Air is hard to crash, which was one of the major concerns of new fliers; all this is because of its seven-camera vision system and three-directional environmental sensing. Dji has included the new Advance Pilot Assistance System (APAS), which doesn’t stop the drone due to an obstacle; instead, it will chart an alternate route and continue flying. However, for the APAS system to work effectively, the drone needs to fly around and survey the area a bit, helping it to pickup information in the process about the surroundings. This prep work is done automatically by the Dji Mavic Air drone. The Dji Air is not completely crash proof as there are no sensors on the top and on sides. The Air drone is quite stable even at winds up to 35 km/hour. This little aircraft stayed stable even while flying by the seaside, where the wind speed can increase suddenly. Transmission range for the Mavic Air is limited to 4km using the controller. The Mavic Air relies totally on the Wi-Fi instead of the radio frequency for its drone to controller connection. There was no problem flying this drone in various continents, but if you push it above the distance limits, you may experience some dropouts in the video feed. The three-axis gimbal is similar to the ones found in the Pro, but it is a redesigned one that makes this drone quite stable. Gimbal control while moving sideways is smooth, but moving the camera up and down is a bit jerky. To keep the footage smooth, it is advisable to switch to the cinematic mode on the app as this is designed to slow down the drone and helps in enhancing the video quality. For getting a steady capture you will have to do a lot of practice. It is able to track about 16 subjects at the same time and when using the active track, the Dji Air was able to track six subjects standing within the frame individually. However, when switching over to quick shot mode you will need all of them together or take one individual as the focal point. Dji has also included some smart gesture controls in the Air drone that are improved and refined. Using your hands you can make the quadcopters land and take off from the ground, fly towards and away from you and make it follow you around as you move. Other than the SmartCapture modes there are some QuickShot modes called the Asteroid and Boomerang. These two modes have preset flight paths that capture short videos with the subject as focus and works efficiently with just a few taps on the app. In the Asteroid mode multiple shots are taken and composed into a 10-second blip beginning with the subject and ending in a spherical bird’s eye view of the locale. In the Boomerang, the drone pans around the subject and then comes back to its original position after a 360-degree circuit. As the Mavic Air has the same 4k camera and three-axis gimbal as the Mavic Pro, the videos and images are excellent. It shares the same 1 /2.3 inch CMOS sensor as the Mavic Pro, but has a narrow ISO range than its bigger bro, which means it doesn’t perform well under low-light conditions. The camera does a good job of adjusting to different lighting conditions. Saving the 4K videos takes a little longer than the low resolution files. The Air often takes about 10-15 seconds to finish processing what it had just recorded. 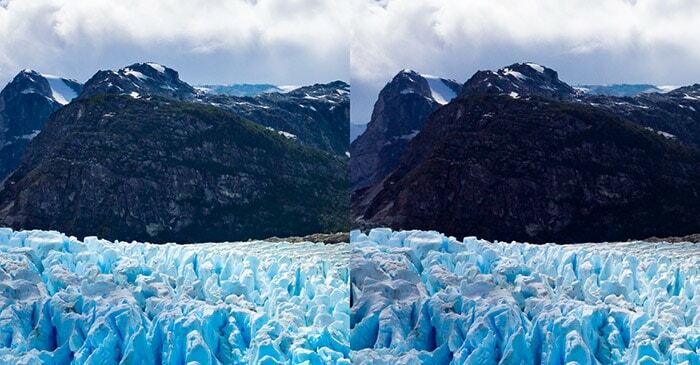 In the HDR mode, the Air can take series of photos at different exposures and combine them into a single shot. The drone stores each photo individually so you can use a photo editor to tweak the HDR yourself. The Air is capable of shooting 4K video at up to 30fps at a bit rate of 100Mbps. If you drop the resolution it can capture 2.5k at 60fps and Full HD at 120fps for slow motion. In well lit conditions, the images are clear with perfect saturation and plenty of dynamic range to work with even though the sensors are small. In gloomy setup the footage looked washed out. The battery life of the Mavic Air is much better than that of the Spark. This is possible because of the 2,375mAh battery that has been introduced by Dji in the Air drone, which is an engineering feat. The Mavic Air can fly for 21 minutes, but realistically speaking it can fly for about 18 or 19 minutes with a single battery. Just like all the Dji drones, the Air lands automatically when the battery levels are low. The Drones sends low battery signals when it is at 15%. You can land the drone manually at that time or wait for the drone to land safely on its own. The battery takes about 55 minutes to charge and sync up with the Dji’s official specs for the drone. With three batteries you can run the Mavic Air non-stop for a considerable amount of time. The Dji Mavic Air is the best drone for most people with some top specs. It is easy to carry around, which makes it very portable. For a 4K video at 30fps, better battery life and improved smart features and obstacle avoidance, you have to shell out only $799, which makes it a value for money drone. Although the camera could have been better, the footage captured is still very excellent. For starters, the Mavic Air is a good drone to start off that is not very expensive too. First timers may find it difficult to operate initially, but with the app the whole process is smoother. With automated features like QuickShot and tracking features anyone can take an amazing shot with no experience needed. If you are looking for an all-round user friendly drone for newbie’s, then the Mavic Air is the right one. Hopefully, the above Mavic Air review must have cleared any doubts about this cute little portable drone. Previous articleWhat Makes Tello The most Fun Drone ever?